I am not sure if I would have bought "Reflections" if Apocalyptica had not added drumming to their music. Their previous albums had just about run the full extent of the gamut when it came to chello-based music, but they have now certainly moved to an entirely new level. Drums on "Reflections" have in fact been played by Dave "Slayer" Lombardo and Sami Kuoppamäki, each about half of the tracks. In fact, the album kicks off with "Prologue (Apprehension)", with Lombardo on drums, which is at once one of the best tracks on the album. The distorted chellos sound like distorted guitars with an unusual edge, and the solos sound like a downtuned violin. And Dave Lombardo lays down some really cool drums. "No Education", the second track, is a bit less aggressive but pretty cool anyway. "Faraway" is a bit of sensitive ballad with more laid-back drums (it's not Dave). "Conclusion" is possibly the saddest sounding track on the album, very sensitive, and the only track with no drums. After that, the album contains a couple of very heavy chello-shred instances in "Resurrection", "Pandemonium" and the excellent, chunky "Toreador II". "Cortége" is a very heavy stomper as well. Only a few of the tracks do not rise above the level offered on earlier albums, so in general "Reflections" rises amply to the challenge of creating an album with familiar yet sufficiently new compositions to keep the fans listening. And, no, not a single cover. First, the CD is copy-protected ("COpy Control"). I don’t condone piracy, i.e. making illegal copies and giving them away or selling them for profit, but I will be damned if I put an original $20 music CD in my car only to see it destroyed by the summer heat or something. And I like to be able to rip a CD to MP3 and play it on my MP3 player (which does not suffer from being bumped or jogged) when going to work. This is madness and I urge you not to buy copy protected music CDs. Thankfully the copy protection can easily be avoided (keep SHIFT pressed while inserting CD in your computer CD player) if you want to make MP3 rips. I suppose making a 1:1 CD copy may be impossible. Second, there is a code if you get the limited edition version. With that code you can download two new exclusive tracks, "Delusion" and "Leave me Alone". Before you can listen to those, however, you have to register at a German web site and download some proprietary software without which the resulting WMA files cannot be played. I find this way too intrusive a method and have refrained from keeping the software and music. 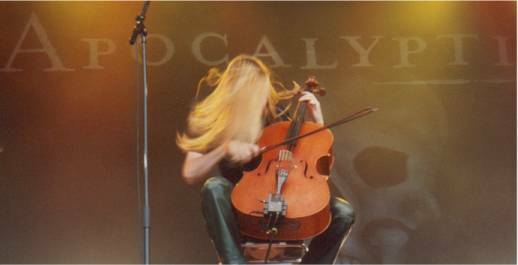 I think Apocalyptica (or their management) should not have made these bonus tracks available this way.